In October 2015, RSSB launched a £500,000 call for research for feasibility studies to develop novel ideas around how to make use of robotic and/or autonomous systems to carry out rolling stock maintenance and inspections in order to help the rail industry reduce time, cost and increase reliability of inspections. On this page you can find information about the research competition and watch footage from the information and networking day. RAS 2020: what innovations in the world of robotics mean for the UK and for the rail industry? Current state of play – How is rolling stock maintenance carried out? Understanding the challenges – An introduction to the challenges that the industry currently faces related to rolling stock maintenance, inspections and servicing. Future maintenance concepts – What challenges will the future present? This session will cover a number of case studies about robotics applications to rail and how they have tackled the technology, reliability, ethics and policy challenges. The case studies in this session will highlight how RAS has been successfully used to maintain assets and perform inspections in the aviation and nuclear industry. 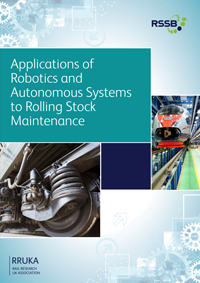 RSSB ran a call for research to develop novel ideas for using robotic and/or autonomous systems to carry out rolling stock maintenance and inspections.